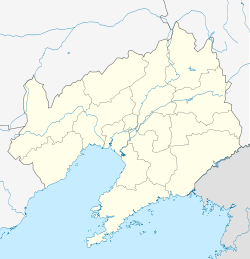 Dawa District (simplified Chinese: 大洼区; traditional Chinese: 大窪區; pinyin: Dàwā Qū) is a district of the city of Panjin, in central Liaoning province of Northeast China. The district has a land area of 1,683 square kilometres (650 sq mi) and a population of 390,000. The postal code is 124200. The district seat is located in Zhanqian Community in Dawa Town. The district was known as Dawa County (大洼县; 大窪縣; Dàwā Xiàn) until 2016, when it was converted to a district. Dawa consists of 6 subdistricts and 10 towns. The Red Beach, a marsh landscape famous for a sea of red plants, is in the district. ^ 辽宁大洼县撤县设区获批复同意，系张学良故里 (in Chinese). 163 News. 6 April 2016. Retrieved 9 June 2018.